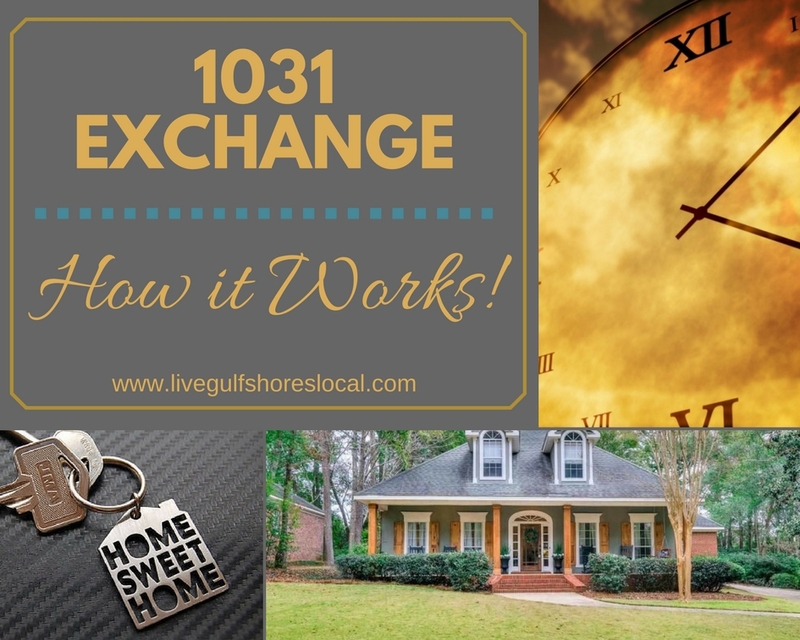 1031 Exchange - How It Works! If you’re a seasoned investor, this article is old news to you but everyday we have more and more people who want to invest in real estate. This is no doubt fueled by a strong real estate market and the many flipping shows we see all across cable TV. 1031 Exchange: How It Works! In a nutshell, a 1031 Exchange is a way to defer taxes when selling one investment property and purchasing another. In other words, it allows an investor to not pay taxes on the proceeds or profit of an investment property that was sold as long as they use those proceeds on a “similar” property. Yeah, we all hate taxes but without them we would live in a world of unpaved roads, no protection, and a country in chaos. HOWEVER, despite what your political beliefs are (and I never mix politics, religion, and my business), you are able to take a break on paying those taxes on the property you just sold. Period. There are rules though (of course)! You’ll read about those rules in a bit but a 1031 Exchange is not only for real estate. You can actually defer paying taxes on a number of assets from artwork to automobiles. But I digress, I am a Realtor and this article is all about using a legal method to put off paying taxes on the sale of a previously sold real estate property. Don’t get me wrong, Uncle Sam wants your money and you will have to pay up sooner or later but you don’t have to do it now if you are buying a new property (see rules). In essence, Uncle Sam is rewarding small business owners and real estate investors for providing homes for everyone. That’s a good thing for everyone! You bought a property 3 years ago for $150,000 and sold it today for $250,000. You netted $100,000. If you don’t want to keep the money for yourself at the moment and decide to invest it in another property, you can pay zero taxes on the $100,000 if you don’t touch it and move it into a new property (see rules). Yes, of course there are always rules. They are complex but flexible. Although there are definite tax benefits to selling your personal home, utilizing a 1031 by exchanging your personal home for a new one will not qualify. Also, a second home (vacation home) does not qualify. The 1031 Exchange solely applies to investment property. You may be surprised that the phrase “like kind” is fairly liberal in its meaning. You can’t exchange a restaurant for a single family home but as long as the property is the same in nature, class, and character, it’s allowed. In order for you to reap the tax benefits of the 1031 Exchange, the new property needs to be at least the same or equal value of the property sold. It’s also allowed to purchase mulitiple properties to equal the one that is sold. For instance, if you sold a property for $600,000 you could buy 3 $200,000 properties to meet the qualifications for the 1031 Exchange. Once you sell a property the clock starts ticking to identify your next property to purchase. You have 45 days from closing to purchase something new in order to defer paying taxes. This doesn’t seem like a long period of time to work with but you don’t have to close on the new property, just identify it. The good news is that you can identify up to 3 properties in case the property you really want falls through. How do you identify a property? A notice to your accountant, Realtor, or attorney is not enough. You also need to notify in writing to the seller of the replacement property and your intermediate representative. You’ll need to include the property (or properties) that you are making an offer on and sign it. Timing is crucial with a 1031 Exchange! In addition to the 45 days to “identify”, you’ll have 180 days to close on your next property. 6 months may seem like plenty of time to close on another property but trust me, it will go by quick. Unless you’re paying in cash, it will take 30 to 45 days to close on a home so keep that in mind. Title to the new property must be in your name within 180 days or you will have to pay taxes on the proceeds. So, in reality, you’ll have a month in a half to identify and a total of 4 months to put something under contract which leaves you 2 months to close. Real estate investors are always looking for the best deal, so you may need to identify 3 homes in order to fall into these deadlines on time. One of the most important rules to a 1031 Exchange is that you can’t have access to the proceeds of sale of the prior property. In my region the vast amount of buyers in Gulf Shores and Orange Beach are investors, looking to get a taste of the 6 million tourists that come to town every year. If you are interested in buying or selling a condo in a high volume area, please contact me. About the author: The above Real Estate information on 1031 Exchange – How it Works! was provided by Jeff Nelson of IXL Real Estate – Eastern Shore. Jeff can be reached via email at jeff@livegulfshoreslocal.com or by phone at 251-654-2523. Jeff has helped people move in and out of properties for nearly 13 years. Thinking about selling your home? I have a passion for Real Estate and would love to share my marketing expertise!